This is Matteo's fifth "Young Guns" dinner and the first we've attended. 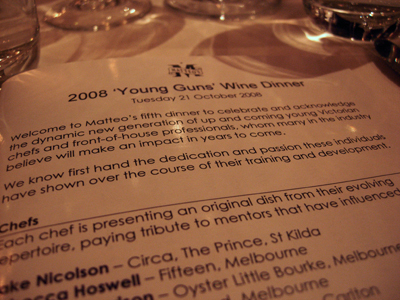 According to the blurb the aim of the dinner is "to celebrate and acknowledge the dynamic new generation of up and coming young Victorian Chefs and front-of-house professionals, whom many in the industry believe will make an impact in years to come"
Indeed, the industry was very much in evidence tonight - from both sides of the fence. Those that actually work and produce something useful and those that pass judgements. It was fascinating observing the seating arrangements. As we waited for the assembled masses to arrive we enjoyed glasses of a just bottled Sutton Grange Flor Rose from Central Victoria. 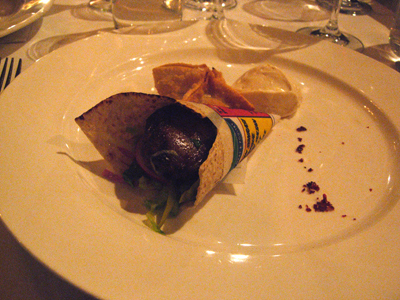 The first food items of the night were made by Jake Nicolson from Circa, The Prince. There aren't any photos as they were finger food - offered up on large trays as we mingled. 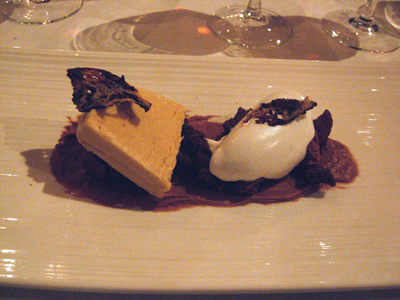 There were three items - a disc of tuna in seaweed with miso pickled asparagus and oyster cream, a foie gras and quince club sandwich cube and a rather striking, parmesan custard and truffled egg white cornet. I'm not sure why there were offered in that order as we felt that after the quince sandwich you couldn't really appreciate the subtle flavour of the cornet. It might have been better to serve the cornet first. MC for the night was Matteo's very own Silvio Sgarioto who certainly entertained us through the evening. Sally Humble from St Jude's Cellars was the sommelier, who we found out is allergic to eggs. The first of our sit-down courses is by Rebecca Hoswell from Fifteen. 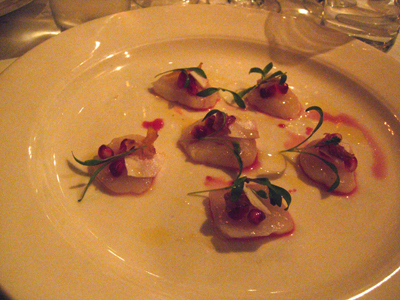 The scallops were sliced and lightly cooked in the lime juice - served quite simply the flavours were clean. Rebecca aptly described it as spring on a plate. It was during the discussion of this course that we found out about Sally's allergy with one of the guests sensibly asking how do you match a wine to a dish you can't taste. Excellent point and one that should be asked of the squawking drongos present. 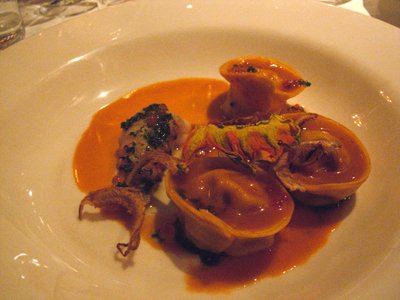 This was our favourite dish of the night and certainly worked in getting us excited about MoMo's reopening. 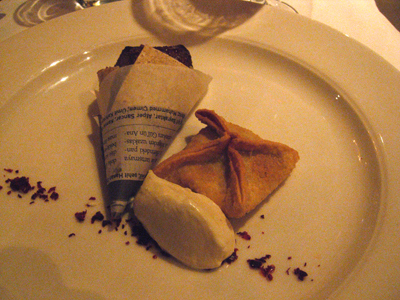 Dessert is by John Paul Twomey from Three One Two. It was very interesting to see a Chocolate Stout offered up as a wine match. All in all, it was an enjoyable night. Good to see and hear from the Chefs outside of the kitchen and get an idea of what motivates them and what they want to do in the future. It was fun and light-hearted and an excellent look into the future.